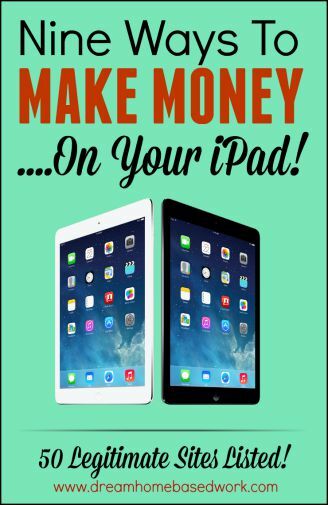 If you've been trying to figure out how you can make money on your Ipad, then this is what you have been waiting for. These jobs will give you flexibility that enables you to do your work wherever you may be. You will have the liberty to set your schedule as well as your working hours and you can work on however many assignments you are interested in. Most of them pay per assignment and some even have bonuses when you get excellent feedback from the customer. Well, here goes! Enroll – This company pays members to test websites from home. You can use you desktop, laptop, smartphone, or iPad. The pay does vary according to the assignment. Payments are sent via Paypal. YouEye – Get paid to complete a variety of tasks with this free mobile application. Each test typically takes around 15-20 minutes to complete. The pay is $12 per completed assignment, paid via Paypal. 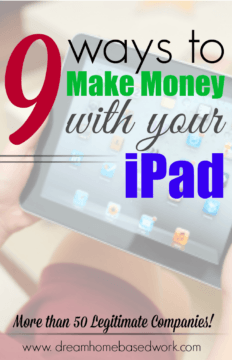 One of the best and easiest ways for you to make some money on your Ipad is to take paid surveys on the internet. There are several FREE legitimate companies that will allow you to do so. Here are just a few. Pinecone Research – Pinecone pays about $3.00 for each survey taken on average. There are rewards for taking part in focus groups, product testing, online surveys and more. Money is paid out via check. MySurvey – This company is always on the lookout for new members who are willing to take surveys online. You earn points when you complete the survey, which you can then redeem in the form of store certificates, gift cards or cash. You need to be at least 16 years old to participate. Opinion Outpost – This site is among the best out there. It is open to UK and US citizens. You earn points here as well and can redeem them in the form of gift cards and cash. Cash can be paid via Paypal or check. Every month there is a prize drawing which you are entered into giving you the opportunity to win the prize drawing. The more surveys you complete the better your chance of winning. Toluna – Toluna will pay you for product testing as well as for taking online surveys. You earn three thousand to six thousand points for each survey you complete. Then you are rewarded in free merchandise, cash, amazon gift vouches and the like. This opportunity is open to those who are 13 years old and above. Ipsos I-Say – Working with some of the leading companies and best brands in the country, this company is considered to be among the largest survey companies around. You take online surveys and earn points for each survey you take. The points are traded in for free prizes, gift cards or cash. Cash can be paid via Paypal or by check. Paid Viewpoint – You take short surveys that are quite simple and make money just like that. 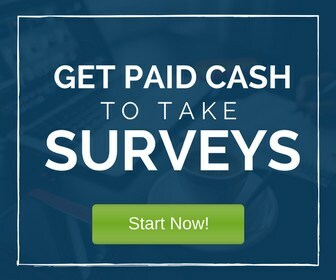 You begin by taking a screener survey and you are paid for that as well. You should focus on increasing the trait score because if you can get it to more than 7000 you will begin making more money for each survey you take. Payment is by Paypal and everyone is welcome to sign up. If you enjoy writing on a variety of topics you will find the various assignments a worthwhile challenge. Write blogs, articles, eBooks, web copy and more with the following companies. Words of Worth – Write content and get paid every month via direct deposit or Paypal. The content is on various subjects and residents of Australian, Canada and the US are welcome to sign up. Triple Curve – Read more– Work from anywhere and get paid for writing articles. The pay rate ranges from 8 dollars to 15 dollars and payout is every week. Copify – This company has both UK and US websites. Freelancers are welcome to sign up and work from wherever they are located writing articles. The payment varies depending on several different factors. Article Document – With over 6000 writers, this company provides lots of opportunity to get work on a daily basis. The work covers more than 135 different genres and industries. There is something for everyone. BlogMutt – If you enjoy writing business posts then this is the website for you. The average pay is $8 for each post that is accepted. HireWriters – They hire experience writers to provide blogs, rewrites, ghost writing services, product descriptions, copy writing and more. Payment is through Paypal. The Content Authority – Are you passionate about writing? This is the place to be. The company creates SEO content customized to the needs of the client. Services include social engagement, copywriting, press releases, eBook Ghostwriting and article marketing. All payments made through Paypal. Writer’s Domain – If you can create high-quality content that is 100% original, you are a right fit for this company. The articles have a star rating system that determines the amount you get for each. 3 star articles which are the standard get $15, while those with a star rating of 4 or 5 get about $17.50. If your article is rejected there is no payment. Pure Content – Content creators extraordinaire! Get paid for creating high-end original content for clients and paid through direct deposit or Paypal. Textbroker – Select the assignment you want to work on and work from wherever you are located around the world. Write articles in the genre you enjoy and receive payment once a week via Paypal. The minimum cash out is $10. Zerys – Zery’s is a platform that allows writers to pick and write content. The client will need to select the writers he would like to access his work though. Avanti Press – Avanti press creates funny greeting cards that bring fun and laughter wherever they are found. The products produced are of high quality with vibrant colors and designs. Tired of working as an employee? Why not employ yourself and work as a freelancer. Here are some websites that give you the opportunity. Elance – Elance allows you to create a profile, post samples and then find work that matches your interests and skills. Your payment is secured because they have a program that makes sure that your money gets to you. Upwork – Formerly known as oDesk, Upwork is a platform that gives freelancers opportunities to make some real cash. Create your profile and get started as soon as you ready. People Per Hour – People Per Hour is another freelance platform where you can find all kinds of work. Hone your skills, create a profile and promote yourself for more opportunities. Freelancer.com This is a platform for crowdsourcing, outsourcing and freelancing. It is open to people from around the work who have the skills to carry out jobs such as writing, graphic design, software development, data entry, accounting, legal services and more. Fiverr – Fiverr offers opportunities to graphic designers, writers, translators, animators, online marketers and others to thrive. Sell your services here to those who have posted jobs that they need done. Task Rabbit –Read Review– To sign on, you will need to have a video interview. Your background will also be checked and then you can have access thousands of available small jobs most of which do not require any particular skills. Humanatic – Get paid to review and sort phone calls from your iPad or home computer. Pays via Paypal. Agent Anything – This opportunity is open to college students who would like to make a little extra money. You sign up and bid for the available jobs. If the job is assigned to you, you simply complete the task and get paid thereafter. Amazon Mturk –Read more-Amazon Mechanical Turk – Make Money While Doing Simple Online Tasks Here you are simply expected to complete a few tasks online. These are considered “human intelligence tasks.” Payment is by amazon gift cards and cash. Clickworker – With Clickworker the average amount that one can earn per hour is $9. However, how much you make is based on the number of tasks that you complete. The payment is through Paypal. CrowdSource – Some of the very easy tasks that you can do on Crowdsource include tagging pictures, editing articles, writing, transcription and the like. You will need to take some tests so that you can earn qualifications. Short Task – With ShortTask you are able to work from home or wherever you may be doing jobs and tasks that are just right for you. Music lovers have the opportunity to listen to music, write reviews and earn some money doing it. Here are two companies that are a great place to start with that. Slice the Pie – If you are a music love then this is just the job for you. You get paid to listen to commercials, new songs and see fashion items and then write reviews on them. Your reviews are then used to give feedback to the designers or artists. Music Xray – With Music Xray you get paid to listen to music to help find music and bands that people may like. Most of the bands are starting out and need the feedback. You get paid for your time. If you enjoy online chatting, then why not do it and earn some money at the same time. There are companies listed below that can give you that opportunity. You can also make money by answering questions online usually on forums. ChatAbout.com – About gives you the opportunity to chat with others online about the topics you most enjoy and get paid for it. Postloop – They pride themselves in making work fun. You get to chat all day and get paid for doing it. You can chat on your Ipad from home or wherever you may be. LivePerson – You will need to be well informed in a particular area so that when people ask questions, you will have the right answer for them. All you need is access to both email and chat. The topics include the arts, sciences, health and fitness and more besides. You will be paid per minute and the cash out is via Paypal and is done once a month. The payout is only paid once you have as much as $50. Cha Cha – Text messages are sent to the site and you get to answer them using your mobile device or your iPad. Each answer is paid between 0.02 and 0.20 dollars. The payment is by direct deposit once a month and you have to have made at least $100. Only US citizens can sign up for these jobs. Weegy – You need to be a topical expert in order to sign up for this chat. Your work is to answer questions asked online. You need to be able to chat or call online. For each answer you will earn 0.20 dollars and the payout limit is set at $20. You also earn points when you share with friends or comment which can mean extra money for you. JustAwnser.com – This company pays you when you answer a question on the internet. Now you don’t get paid to chat but to answer questions that others have left there. You get paid half of what the clients pay and you then get paid when you reach the cash out limit of $20. Payment is made once a month. 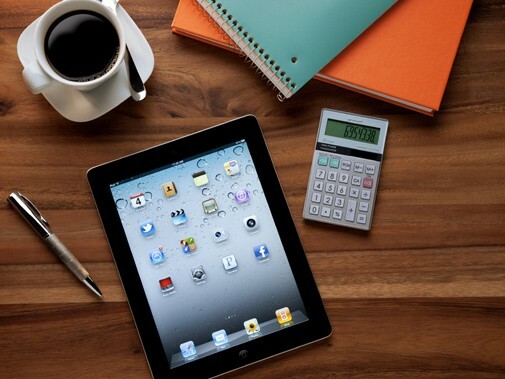 If you enjoy teaching and tutoring you can become an online tutor and make some money that way using your iPad. Here are some companies you can consider. Tutor.com – This site is open to professors, teachers and college students who are willing to tutor. The positions available include finance, economics, college physics and accounting among others. Udemy – Become an online expert and use their teaching platform to share your knowledge. You are able to set your own price for each lesson (ranging around $20 – $50). Elevation Tutoring – Online tutors are hired for specific subjects. You will need to be on skype and to provide the hours when you are available when you put in your application. Off2Class – Tutors for every subject are constantly being hired. Tutoring clients range from grade school to college. They also help with homework, study skills and test preparation for standardized tests. iTalki – If you speak a foreign language fluently why not use become a language tutor with iTalki. Books, flash cards and apps are used in tutoring. The tutoring all happens online therefore all you need is your iPad. If you're looking for a way to make extra money from your iPad or smartphone, then you should definitely consider downloading these free apps available on the Android market or Apple app store. Field Agent – Field Agent is a free app that pays you for completing a variety of tasks. The pay is typically between $3 and $12 per online task. You can choose to withdraw your earnings at any time via Paypal. Payments are typically made withing 48 hours of completing the job. Easyshift – Easyshift is a great online task site that pays within 48 hours, via Paypal. ibotta – This free app is like having a coupon book in your purse! Ibotta allows you to make cash back for grocery shopping at you favorite stores. You can withdraw your earnings once you reach $10.00, via Paypal, amazon giftcards, and more. GigWalk – This is a great mobile platform that connects you to the job that is right for you. You can do the work wherever you are and you have lots of flexibility to get the work done. Zappidy – This app will allow you to make money by completing a variety of tasks. It can only be downloaded on iPads and iPhones from you Apple store. Most jobs pay anywhere from $2.00 -$10.00. Payments are deposited right into your Paypal account. So there you have it! An extensive list of money making opportunities that can be done on you iPad. Did I miss any? Feel free to share them in my comments below! 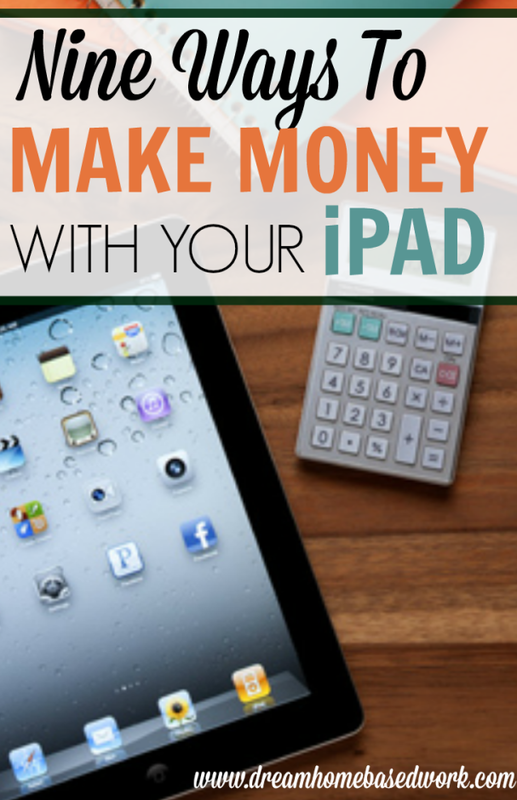 Thanks for sharing this awesome post about how to make money on your Ipad. Indeed, freelancer writing jobs offer great convenience. This is the easiest way to pursue lucrative jobs online. You can do the job at your own convenience and pace. As long as you are productive you can expect earning huge income. The good thing about freelance jobs is that it does not require bachelor’s degree. As long as you have the talent and skills of writing, then you can start as soon as you want.